[New for 2018] You know what I haven't done in a really long time? Check to see if they ever built any more Sonic Drive-Ins in my area. It seemed like forever that my only choice was the one outside Boston (meaning it was 70-75 minutes from my house). That's too far to go, but guess what? There are now 6 Sonics in my area and it's time for a family snack break. Disclaimer: You want to here something funny? I have had a Sonic gift card laying around since... (checking my email) oh geez, September 2014!! And guess what? There was almost enough money on it to cover our snack break today. I was just 4 cents shy of breaking even. So, belated thanks to Sonic for the gift card. On to the review! It's pretty good looking right? The funny thing was that they served it to me inside an insulated cup so that it could neither fall over or drip on me. I appreciated that. I took a few pictures and dug in. Did I enjoy it? Yes. Easily. Did I love it or thing it was perfect? No. It's one of those nice treats that you can't help but want to be a little better. In particular I wanted a bit more Oreo flavor. I was getting it from the fresh waffle cone, and I got it from the Oreo cookie pieces, but I wanted a bit more cookies & cream vibe from the soft serve. My daughter chimed in and said it would have been cool if they layered it a bit. There were a few extra Oreo pieces at the bottom of the cone, but alternating layers of soft serve and Oreo pieces would have been great. It was definitely a fun and unique flavor and I'm glad I got to try it. Did I mention the cone was nice and fresh? I couldn't really discern the soft serve from the sweet cream icing, instead it just tasted like sweet cream the whole way through. It's actually a pretty neat trick. If you want to get nitty gritty, we could get in to the specifics of the airiness of Sonic softserve or the fact that their softserve isn't that cold, but I don't want to knock the treat too much. I still enjoyed it. I just couldn't help but want a bit more from it (don't forget that cookies & cream is pretty much my favorite classic flavor, so all Oreo & ice cream things lead back to it). 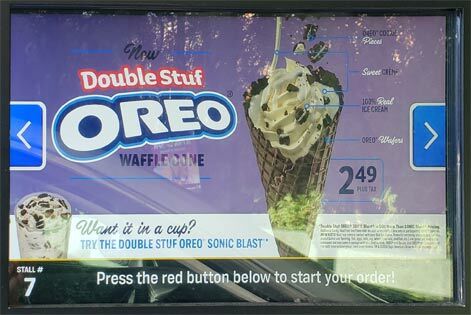 Now there is also the Double Stuf OREO Sonic Blast available and that's what my daughter got. She liked it but also didn't love it. She couldn't help but compare it to her favorite Oreo Blizzard. I didn't take a photo because there's not much to see. It's just some Oreo chunks sticking out on a Sonic cup. Not to be left out of the Oreo fun, my wife decided to try the Oreo Cheesecake Shake. I probably should have tried a sip so I could have made more comments other than she said it was cheesy and that there were a lot of Oreo pieces at the bottom. So, there ya go, our first trip to Sonic in almost three years. We will try to stop by in a bit more frequently now that it's a lot easier to get to. I tried it and thought it was good. I liked the "grit" texture that was coming from the creme. 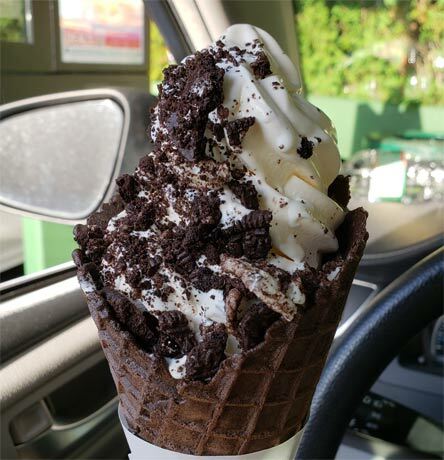 I liked that aspect of getting that oreo concept and I agree with you that should had put oreo crumbs on the bottom of the cone and incorporate in the soft serve. I hope Sonic do different cookie concepts in a cone. Maybe changing the cone flavors. Finally tried it yesterday and I like it. I agree with adding more oreo pieces but I think the oreo cone helped the chocolate cream flavor.